I remember singing that Sunday School song as a child. I loved the story of Daniel, the Jewish prophetic prayer-warrior and his no-bending-to-the golden-calf buddies, who were sent to a furnace, where their Saviour met them in that hot spot. Some may say he was a dreamer (giggle …) in his Babylonian digs with the insomnia-suffering big guy, Nebuchadnezzar. But there was a part that, as a child, I missed. that friend who lives with daily physical pain (and more), yet she intercedes for others in prayer. that teen whose parents divorced, and yet her faith seems to grow every day. that man who suffers from a brain injury after being hit by a distracted driver, and yet his laughter is his daily gift to many. that parent who is aching from rejections from his kids, and yet he is available to them when they come to him. that woman who is lonely for her husband, yet she knows that God is with her. Despite pain, loneliness, rejection and other anxiety-prompting circumstances, they hope in the One who can change their situations … but who doesn’t always do that. I think that the purest form of humility is worshipping one who can, but doesn’t always. 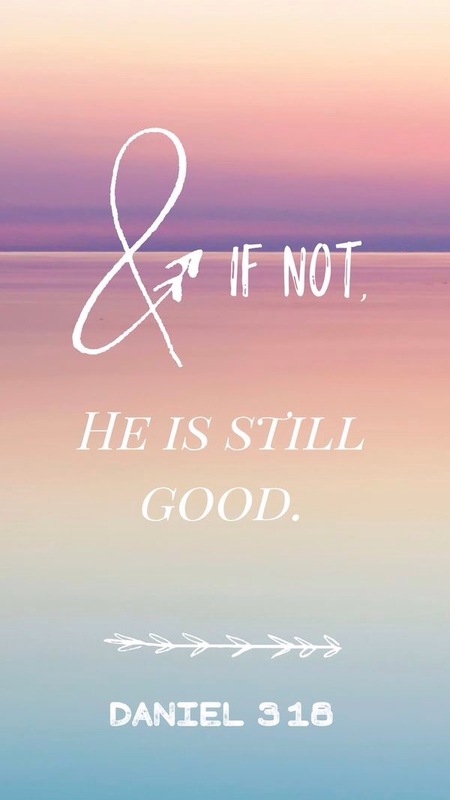 He is able, he can … but even if he doesn’t, our hope is still in him … alone. Even If is a song by Mercy Me. Maybe, today, you need the encouragement that such Daniel songs taught us in childhood. And he is there, always there with us. May you feel his presence in your day.